Styles of Rock ClimbingMost of the climbing done in modern times is considered free climbing — climbing using one’s own physical strength, with equipment used solely as protection and not as support—as opposed to aid climbing, the gear-dependent form of climbing that was dominant in the sport’s earlier days. Free climbing is typically divided into several styles that differ from one another depending on the equipment used and the configurations of their belay, rope and anchor systems (or the lack thereof). 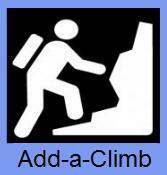 Free climbing – The most commonly used method to ascend climbs refers to climbs where the climber’s own physical strength and skill are relied on to accomplish the climb. Free climbing may rely on top rope belay systems, or on lead climbing to establish protection and the belay stations. 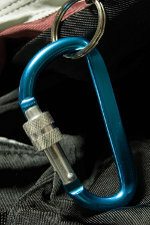 Anchors, ropes and protection are used to back up the climber and are passive as opposed to active ascending aids. 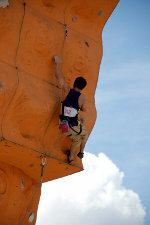 Subtypes of free climbing are trad climbing and sport climbing. Free climbing is generally done as “clean lead” meaning no pitons or pins are used as protection. Free soloing (not to be confused with free climbing) is single-person climbing without the use of any rope or protection system whatsoever. 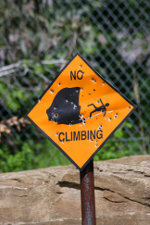 If a fall occurs and the climber is not over water (as in the case of deep water soloing), the climber is likely to be killed or seriously injured. Though technically similar to bouldering, free solo climbing typically refers to routes that are far taller and/or far more lethal than bouldering. 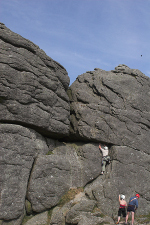 The term “highball” is used to refer to climbing on the boundary between soloing and bouldering, where what is usually climbed as a boulder problem may be high enough for a fall to cause serious injury and hence could also be considered to be a free solo. Deep Water Soloing – Similar to free soloing in that the climber is unprotected and without a rope, but different in that if the climber falls, it is into deep water instead of on to the ground. 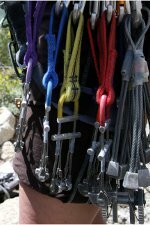 Top roping – Climbing with the protection of a rope that’s already suspended through an anchor (or also known as a “Top Rope System”) at the top of a route. A belayer controls the rope, keeping it taut and preventing long falls. 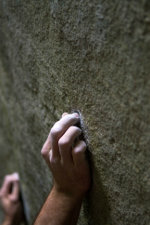 Most Indoor climbing or “gym climbing” is top roping on indoor purpose-made climbing walls although it is also common to boulder and sport climb indoors. Gym climbing is used as training for outside climbing, but some climb indoors exclusively. Due to its reduced risk, most beginners are introduced to climbing through top-roping.